After the International Winter School «Energy, oil and gas in the Arctic region» in Arkhangelsk, it’s soon time for the International Summer School «Arctic Logistics» in Moscow. In 2017, a joint Norwegian-Russian scientific and educational project «Logistical and environmental management of natural resources development and transportation in the Arctic area (Arctic logistics)» was started. Molde University College is the main partner institution in Norway. Within the framework of this project it is planned to organize summer schools and seminars for students who are interested in the Arctic research and to develop students mobility to the partners of the project for the purpose of writing the joint scientific papers. You will find detailed information about the project here on Molde University’s homepage. On 11-17th of March 2018, NArFU (Northern [Arctic] Federal University named after M.V. Lomonosov) in Arkhangelsk in Russia hosted an international winter school: «Energy, oil and gas in the Arctic region», where Anatoly Zolotukhin was the academic director. He is the coordinator of the joint project for the main Russian partner institution – Gubkin Russian State University of Oil and Gas in Moscow. Anastasiia Vysochyna, Cecilie Maria Camitz-Leidland and Hendrik Dybdahl – all 1st year master’s students of petroleum logistics at HiMolde – participated in this school. They were accompanied by Gubkin University representative, joint project participant and Molde University graduate – Alina Kovalenko. (Editor’s note: Kovalenko is the author of this article.) Also, master’s and graduate students from China, Sierra Leone, Indonesia, Serbia, Ukraine, Belarus and Uzbekistan attended the winter school. According to Anatoly Zolotukhin, it is an international event, because it is impossible to work without cooperation in the Arctic. We need to work together to deal with oil spills, to train engineers according to the same rules, so that in case of emergency situations everyone can act cohesively. During lectures participants discussed global problems related to environmental safety, fisheries issues, extraction of mineral resources, oil and gas in the Arctic. Participants were engaged in the study of offshore drilling, oil, gas, core in the Arctic region exploration and alternative energy implementation. The studying process was full of laboratory studies, practices, expert speeches and lectures. As a result, all participants got certificates and 3 ECTS. Also, the Case Championship was held during the school. School participants, divided into 4 working groups, presented projects dedicated to the development of the field, the search for potential suppliers and the problem of liquefied gas transportation in the Barents Sea region. All working groups were international and were looking for productive ways of international cooperation in the Arctic region. The team in which Cecilie Maria Camitz-Leidland and Alina Kovalenko took part, got the first place. There were also room for cultural activities during the winter school. 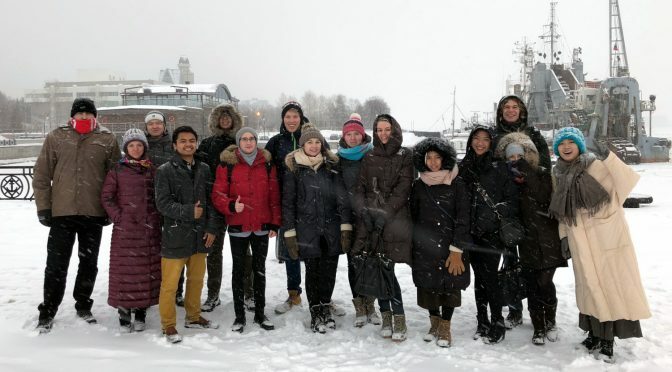 Students had a chance to walk along the icy Northern Dvina River, get acquainted with the history and architecture of Arkhangelsk on a sightseeing tour, visit one of the oldest Russian Wooden Architecture Museum in Malye Korely and visit the Geological Museum named after N.P. Laverova. Learning about Arctic environment and challenges was very interesting. To work with students from all over the world was inspiring and it is nice to use what we already learned on our lectures to solve real life problems. We got divided into four groups with the same task. We got the task on first day of the winter school, and we supposed to present solution for the business case on the last day. The winter school in Arkhangelsk was challenging, but interesting and useful. We get overview about Arctic territory, it’s issues and perspectives, hard conditions and environment in the region. The program included a lot of excursions and common meetings, where students had possibility to communicate and get know each other, as well as discuss specific of studying at their universities from all over the world. It was very interesting to learn more about oil, gas and energy in the Arctic region and the environmental, technical and economical challenges related to this area. The programme for the winter school was organized very well and the volunteer students were very helpful to us. This was my first time to Russia. Learning more about the Russian culture was very fun and interesting, as well as cooperating in groups with our business cases in an international environment. All in all, this was a very good experience. All participants agree that the winter school was useful and will help us in the sphere of our future activity. We are glad to invite students to join the summer school on Arctic logistics, which will be held from July 29th to August 5th 2018 at Gubkin University in Moscow. The school is organized as part of the cooperation project between Molde University College and Gubkin University. After studying program all participants will get certificates and 5 ECTS. An interesting cultural program is also part of the summer school. You will find more information about the summer school program and how to participate here on Gubkin University’s homepage.